As Federal, and State, funds for computers in classrooms dry up, many public schools are looking at Bring Your Own Device (BYOD) as a way to provide students with technology. In a better world this wouldn’t be necessary; but sometimes you just need to get on with finding a solution rather than hoping for the world to change. This is probably one of those times. One of the problems when you contemplate BYOD is trying to find any relevant information about a way forward. There’s quite a lot of information from the USA but the context does not translate easily to circumstances found in a NSW Department of Education and Communities school. Someone’s obviously noticed the gap and moved to fill it: The Department has a temporary internet site up with policy documents and information on BYOD. It’s actually a pretty good information resource containing both policy and very practical information. One aspect I really like is the emphasis on change management. To my mind the key to success in an exercise like this is making the people involved understand the need for it in the first place. That the decision is driven by teaching outcomes. If those involved buy into the underlying idea, then everyone can work together to overcome the practical issues that arise. In the case of BYOD in schools this is complicated by the fact there are so many constituencies involved. The kids love the idea of 1-1 devices and having something they can control – but they’re not the ones buying and supporting the device. Teachers need to understand that the devices have to be used in class to demonstrate value. And, of course, it’s the parents that need to be persuaded of the underlying need and the specific approach; and that’s where the primary change management challenge comes in. In fact, as the DEC site grows, it would be nice to see a section aimed directly at parents. 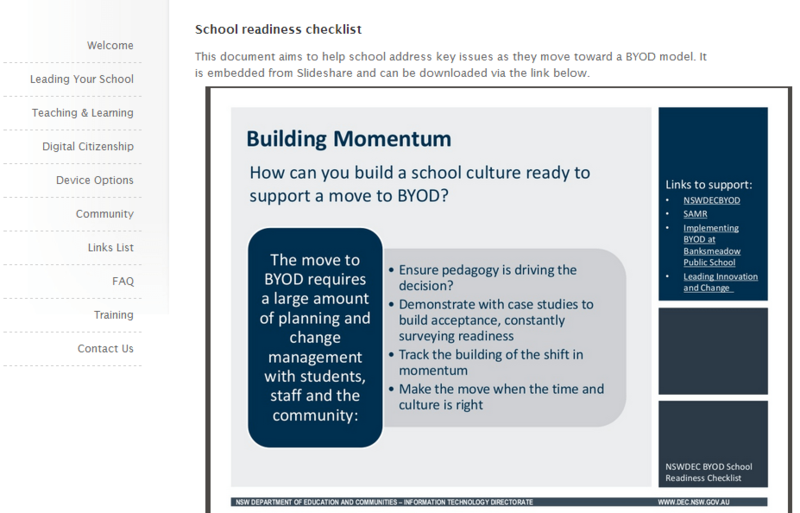 The DEC site is a treasure-trove of information on all aspects of BYOD but has a strong emphasis on change management and need for the decision to implement BYOD to be driven by teaching outcomes. The site is backed up by a Google+ community and an excellent Twitter feed with the hashtag #nswdecbyod. Whether you are a parent or a teacher this is a great resource. The Bring Your Own Device Support site can be found here.